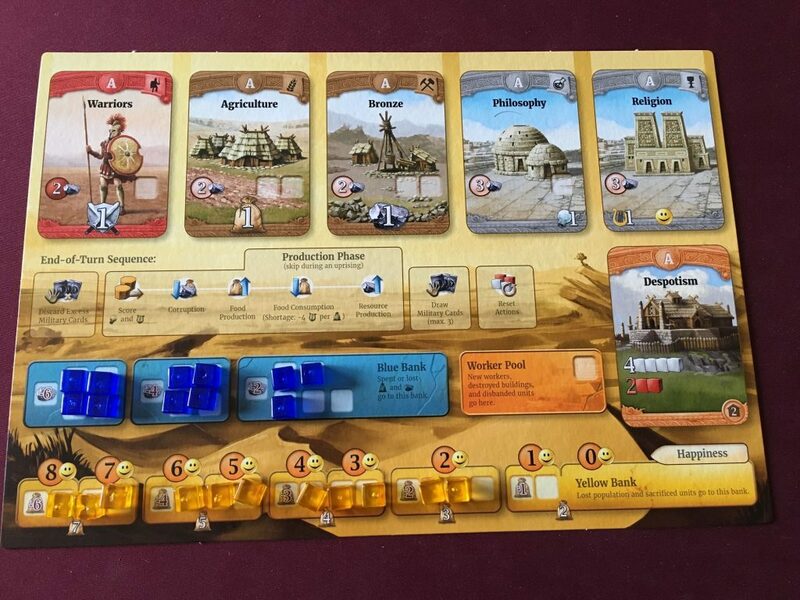 Through the Ages: A New Story of Civilization (“TTA”) is a civilization building game for 2-4 players designed by Vlaada Chvatil. 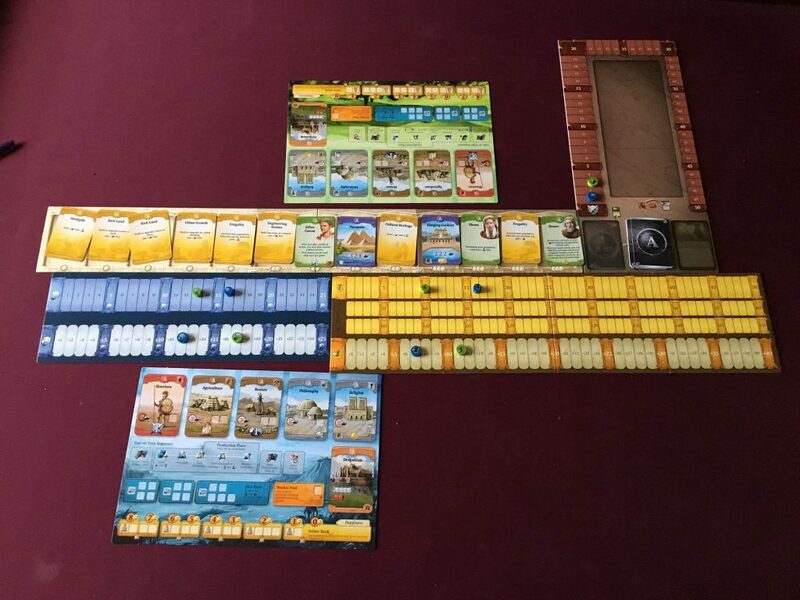 In TTA, players have to carefully balance their food, raw materials, science, and military in an effort to become the most influential civilization in the world. 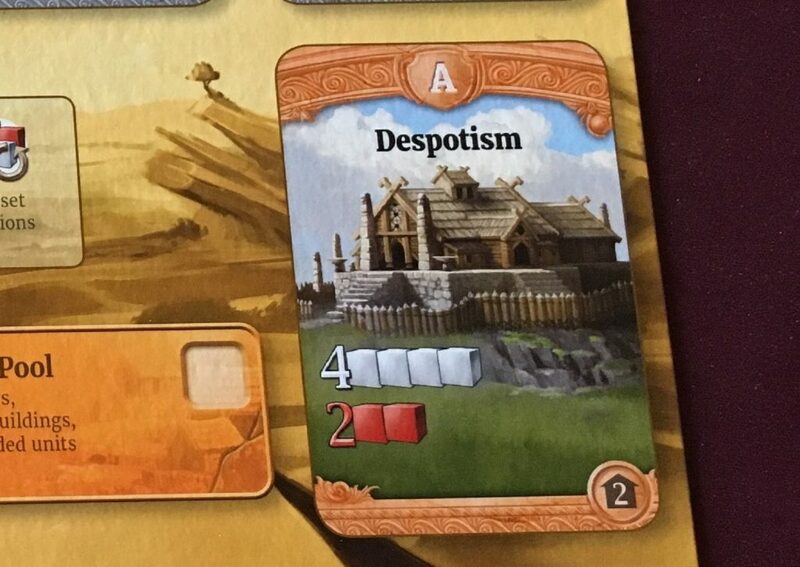 The game takes place over five Ages, during which players take turns drafting cards, creating workers, constructing buildings, declaring war, and colonizing territory. The goal of all this activity is to accumulate culture points: the player with the most culture points at the end of the game is the winner. Fill up the card row, check and see if the end of an Age has occurred. Do things like declare war, colonize territory, and steal other players’ stuff. Do things like create population, build buildings, declare leaders. Score culture, produce food/resources/science for the next round, try not to starve. In the middle of the playing area is a line of cards, each with a symbol of the related Age. These cards serve as a timer, and as each Age’s deck is depleted, the next Age begins. Players move through the phases noted above, back and forth, until all the Age decks are depleted. Cards are divided into two categories: civil and military. Civil cards represent concepts like technology, units, wonders, or leaders while military cards contain things like war, aggressions, colonization, and unit tactics. There is also an event deck which will fire during the Political Phase when players introduce new events into the flow of history. 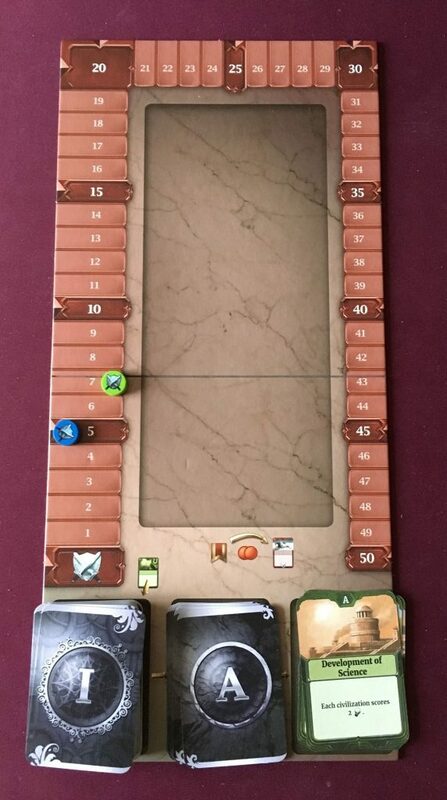 Certain events grant points at the end of the game, so managing the event deck becomes a priority for final scoring. Players also have two pools that determine the number of actions they can take in a turn: civil and military. In order to play a card, the cost is paid by spending either a requisite civil or military action and the appropriate point cost on the card. There are three main types of points that can be used to pay for things in the game: food, resources, and science. A primary goal throughout the game is to create an engine that generates these points faster than your opponents. Players also need to be aware of effectively spending resource points they have generated. If they don’t, the corruption mechanics of greed and avarice kick in which will bleed away those precious resources to the black market. Population, food management, and happiness are also key concepts. Workers are generated through the production of food. They are then placed on cards to note the type of points (food, resource, science, culture, etc.) that unit of population generates. However, the more workers a player has, the more happiness they need to create to keep the populace productive. Happiness is generated primarily through urban developments (like theaters and sports arenas) and the amount produced is noted at the bottom of the population track. If the player doesn’t generate enough happiness to keep his population productive, things break down quickly. The concept of military power is represented as a total strength number for each civilization. Strength is used primarily during the Political Phase when evaluating the impacts of wars, colonization, and aggressions. The main way to build strength is by researching and constructing military units and tactics. Using total strength to destroy other players’ buildings and steal culture points can be particularly effective. Balancing the right ratio of military to urban improvements creates strategic dilemmas for the player. 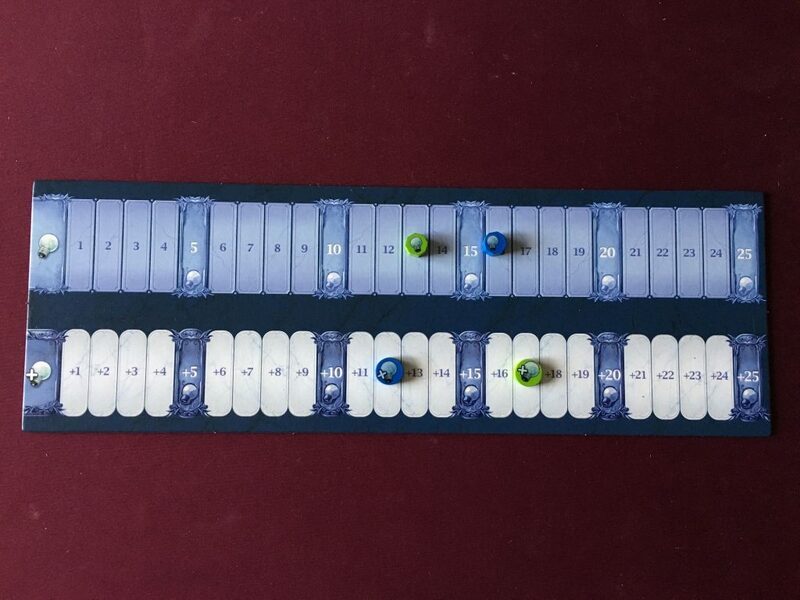 The military board tracks the players’ total military strength. This is also where the event deck lives. Leaders are also a source of strength for any civilization. 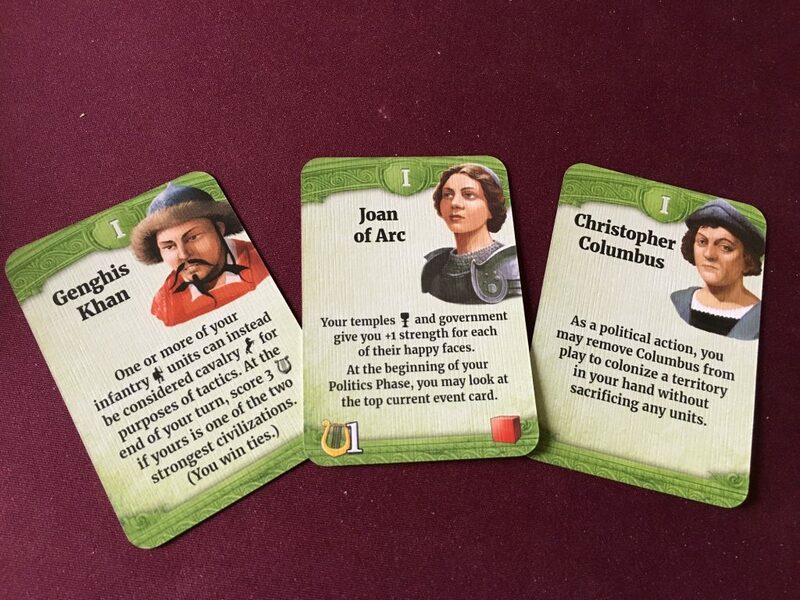 Leaders are represented by civil cards, available for drafting, and the Age they are from is represented on the top of the card. Leaders are all unique and have a particular ability that mimics their place in history. For example, Moses makes generating population less costly; Ghandi makes it more expensive for other players to declare war, etc. Leaders can be changed over time and their selection can bolster different player strategies. While all of these concepts can seem disjointed and confusing at first, there is a symmetry and balance to the game that emerges after a few plays. It’s like looking at a mechanical watch and marvelling at how the tiny and seemingly insignificant pieces contribute to the whole. Through the Ages isn’t an easy game by any stretch of the imagination and it can seem quite intimidating at first blush. There are a lot of physical components and this probably adds to that overall sense of foreboding. However, once you begin playing the game, it’s actually pretty easy to pick up on how the various mechanics work together. Like many complicated games, TTA rewards the player the more it is played. With no built-in method for handicapping a more experienced player, newer players will always be at a major disadvantage. This is one big negative about the game. Unless you’re playing with the same group of people repeatedly, it might be a difficult proposition to get people to agree to playing again if their initial play is frustrating. Another negative is that TTA is a very fiddly game. There are a lot of moving pieces and a lot of different items to keep track of, which can get tiring after awhile. Overall, though, these are the game’s only real negatives and they’re nothing unique to Through the Ages. The science board tracks accumulated science points as well as how many science points a player will earn each production phase. Those few negatives aside, Through the Ages is a magnificent game. Each element of the game mixes with the other to create an exciting, edge of your seat experience. This excitement is especially heightened during the final scoring. It is not uncommon for the heir apparent to become dethroned by another player’s clever manipulation of the event deck. 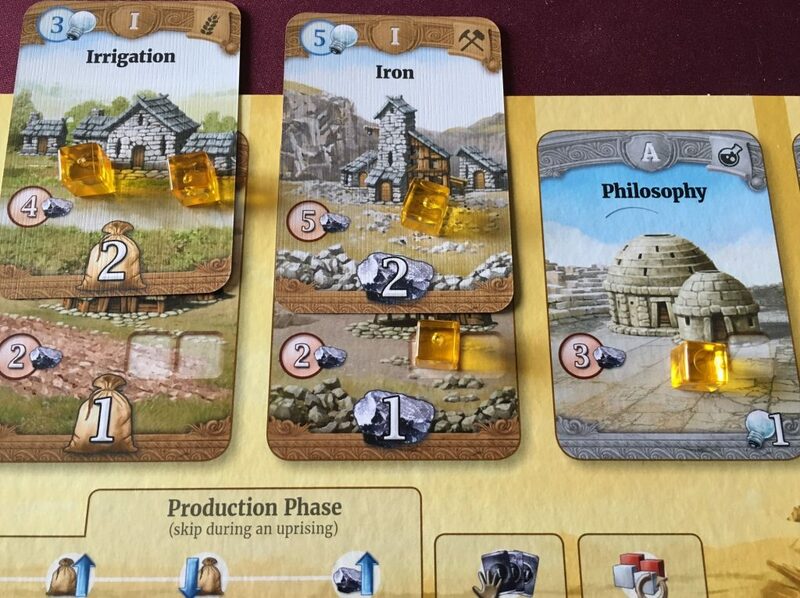 It’s no wonder that Through the Ages sits comfortably in the top 5 games on BGG and it’s not likely to go away anytime soon. Give this game a try for yourself and you’ll see why. Is it just me, or does Napoleon look just like Mads Mikkelsen?